Leamington boss Paul Holleran was left with a serious case of ‘what-ifs’ after seeing his side slump to a damaging 3-2 defeat at Tamworth on Saturday. A man-of-the-match performance from James Belshaw - a player Holleran looked to sign in the close season - plus a couple of howlers from young loanee Jonny Maddison left Brakes three points from safety with only two matches left of their Conference North campaign. We’ve lost good players over the last couple of seasons and not replaced them with the same calibre. But while Holleran refused to single out Maddison, claiming the defence was equally culpable for Tamworth’s first, he said the rapid turnover of goalkeepers since Tony Breeden’s exit in the summer had been a contributing factor to their current predicament. “It’s been a major problem,” said Holleran. “When we signed Mats Morch from Derby I thought we had solved the problem but he broke his collarbone. “We’ve lost good players over the last couple of seasons and not replaced them with the same calibre. 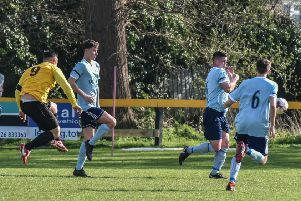 Two goals inside the opening 12 minutes led to Brakes’ eighth defeat in nine but Holleran was encouraged by his side’s response, with only a mixture of good keeping and poor finishing preventing them taking something from the game. “We responded well, played in the right areas and at half-time we should have been in front. “In the second half we opened them up at will. “We’ve had a dozen good chances. Not half-chances. Despite Brakes’ fate now being out of their own hands, Holleran says their only focus is on picking up three points at home to North Ferriby tomorrow. “We’ll go out for three points and look at it again at 5 o’clock. “It’s not ideal but we’ll try and take it to the last game. Jamie Tank is pushing for a recall tomorrow having dropped down to the bench last Saturday following a bout of food poisoning.